Gourds in general are often under appreciated and possibly even unknown in some parts of the world. 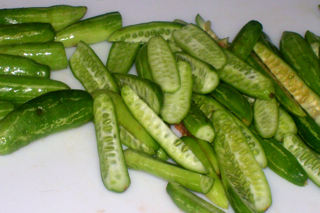 The incredible versatile ivy gourd is one of my favorites. It takes only a few minutes to cook, and are juicy, crisp and delicious. In the US and other western countries, you will probably need to go to a speciality Indian store to find this. These are known as Kovakka or Tindora. This version is the simplest way of cooking this, and goes perfectly with a bowl of steamed rice, or with your favorite Indian bread. 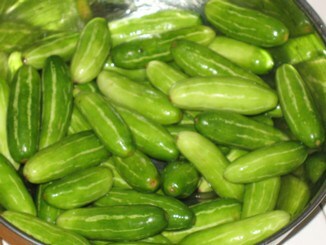 Wash the ivy gourd well in a colander. Slice each one lengthwise, and then each half into two-three steps. 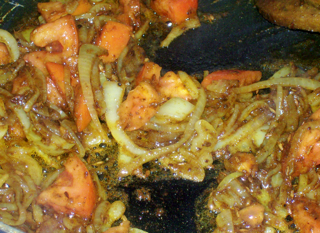 Heat the canola oil in a sauté pan over medium heat, and add the cumin and fennel seeds. As soon as they start frying, add the pepper, turmeric and coriander powders. Fry this for about 30-40 seconds. Add the sliced onions and sauté until they turn translucent. Add the chopped tomatoes, and a 1/2 tsp salt. Drop the heat to low, cover and cook for 10 minutes, until the tomatoes are soft. Mash the tomatoes slightly using the back of your spoon. Add the red chilli powder and sauté for another 5 minutes. 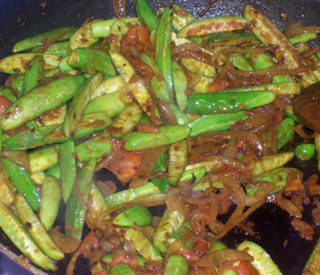 Add the chopped gourd with the remaining tsp of salt. Sprinkle a few drops of water, cover and cook over low heat. After 10 minutes, test the kovakka, They should be soft and cooked through, but still crisp and juicy. You may need about 5 to 10 more minutes, depending on the how many gourds you are cooking and how big your pieces are. Sprinkle fresh cilantro and serve.